Cold Steel Pocket Knife Folding Blade with lock Camping Survival Xmas Gift. Item No: 53501. Red SwissChamp. Victorinox Original Swiss Army Knife. In 1897 the Original Swiss Army Knife was created in the small village of Ibach, Switzerland. We also have a full line of original Victorinox Swiss Army Accessories. In 1897 the Original Swiss Army Knife was created in the small village of Ibach, Switzerland. We also carry a full line of original Victorinox Swiss Army Accessories Including Cutlery Edge Guards! For our full line of Victorinox Swiss Army Knives. In1897 the Original Swiss Army Knife was created in the small village of Ibach, Switzerland. We also carry a full line of original Victorinox Swiss Army Accessories Including Cutlery Edge Guards! For our full line of Victorinox Swiss Army Knives. It's in very good condition with pristine blade and tools. Normal surface scratches on scales. Blade, scissors and a nail file. Item No: 53014. In 1897 the Original Swiss Army Knife was created in the small village of Ibach, Switzerland. Victorinox Original Swiss Army Knife. Green Classic SD Shamrock. We also have a full line of original Victorinox Swiss Army Accessories. Model #: 54900. The title of Knife of the Year 2007 was awarded to the Victorinox Rescue Tool during the IWA, the largest knife exhibition in the world. In 1897 the Original Swiss Army Knife was created in the small village of Ibach, Switzerland. Swiss Army 53681 Ambassador Multi Tool from Victorinox Swiss Army. The compact Ambassador Swiss Army Knife by Victorinox features all the basics you need with none of the extras you don't. Swiss Army Ambassador Features. Victorinox Swiss Army 53401 Executive small pocket knife made of stainless steel material with red plastic scales. Victorinox Swiss Army 53401 Executive knife features a 10 functions and component scales for outstanding grip and includes a peeler and long nail file. Now PRICED WELL BELOW CURRENT TREND VALUE. Translucent Onyx SwissCard Lite. Item No: 53333. In 1897 the Original Swiss Army Knife was created in the small village of Ibach, Switzerland. Victorinox Original Swiss Army Knife. We also have a full line of original Victorinox Swiss Army Accessories. Model #: 53900. The title of Knife of the Year 2007 was awarded to the Victorinox Rescue Tool during the IWA, the largest knife exhibition in the world. In 1897 the Original Swiss Army Knife was created in the small village of Ibach, Switzerland. The Victorinox Zodiac Series is a collection of Classic key chain knives with individual signs of the Zodiac printed in black on Cellidor handles. The Zodiac sign and standard Victorinox logo both appear on the top scale. Model 54752. In 1897 the Original Swiss Army Knife was created in the small village of Ibach, Switzerland. Victorinox Swiss Army. The ultimate in cool, yet still so hot. We also have a full line of original Victorinox Swiss Army Accessories. Item No: 53973. Red Minichamp. In 1897 the Original Swiss Army Knife was created in the small village of Ibach, Switzerland. Victorinox Original Swiss Army Knife. We also have a full line of original Victorinox Swiss Army Accessories. Item No: 53739. Red Alox Money Clip. In 1897 the Original Swiss Army Knife was created in the small village of Ibach, Switzerland. Victorinox Original Swiss Army Knife. We also have a full line of original Victorinox Swiss Army Accessories. 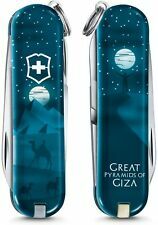 Victorinox Swiss Army Limited Edition 2018 Classic New Zealand. In 1897 the Original Swiss Army Knife was created in the small village of Ibach, Switzerland. We also carry a full line of original Victorinox Swiss Army Accessories Including Cutlery Edge Guards! Victorinox Swiss Army Limited Edition 2018 Classic New York. In 1897 the Original Swiss Army Knife was created in the small village of Ibach, Switzerland. We also carry a full line of original Victorinox Swiss Army Accessories Including Cutlery Edge Guards! More importantly, the unit contains all the classic Swiss Army tools, including Victorinox attends to every detail, from selecting the finest materials to performing the final inspection. In addition, each individual tool has been hardened in a different way to stand up to its designated use. It all started with the Swiss Officer’s Knife – and more than a century later, the Swiss Army Knife is still an icon of sleek functionality. Whether you're in the Navy, or just like the sleek military look, the Classic SD will allow you to tackle any situation life throws at you. Model # 53976. Midnite Minichamp - RED. In 1897 the Original Swiss Army Knife was created in the small village of Ibach, Switzerland. We also carry a full line of original Victorinox Swiss Army Accessories Including Cutlery Edge Guards! Model 53945. In 1897 the Original Swiss Army Knife was created in the small village of Ibach, Switzerland. Victorinox Swiss Army. We also have a full line of original Victorinox Swiss Army Accessories. Item No: 53341. In 1897 the Original Swiss Army Knife was created in the small village of Ibach, Switzerland. Victorinox Original Swiss Army Knife. Red Super Tinker. We also have a full line of original Victorinox Swiss Army Accessories. Item No: 53401. In 1897 the Original Swiss Army Knife was created in the small village of Ibach, Switzerland. Victorinox Original Swiss Army Knife. We also have a full line of original Victorinox Swiss Army Accessories. Swisslite Translucent RUBY. Model # 54033. In 1897 the Original Swiss Army Knife was created in the small village of Ibach, Switzerland. We also carry a full line of original Victorinox Swiss Army Accessories Including Cutlery Edge Guards! 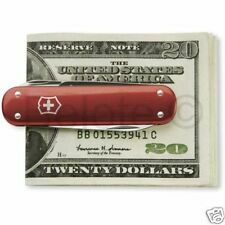 Swiss Army (Style) Pocket Knife Type 11 Function Pocket Camping Scouting Knife 3202. Rothco 3202. Swiss Army Style Type 11 Function Pocket Knife 3202. The classic Swiss Army Type knife has 11 features including a screwdrivers, scissors, toothpick, tweezers, blades, saw, awl, fish scaler, corkscrew can opener, bottle opener and more. Victorinox Swiss Army Limited Edition 2018 Classic Aloha Kakou. In 1897 the Original Swiss Army Knife was created in the small village of Ibach, Switzerland. We also carry a full line of original Victorinox Swiss Army Accessories Including Cutlery Edge Guards! The Victorinox Camper is a 91mm knife with 3 tool layers that has a long history. The Camping logo has gone through several revisions and was produced in both inlaid designs as well as hot stamped and hot printed. The logo is not unique to this particular model, and is available on a few models, for instance the Ranger. NO EXCEPTIONS. First in an Old Globus Album, then a Scott's International I, specializing in Pre 1940. The shelves are full of other collectibles, and many must go. Victorinox Classic SD with Boy Scouts Logo. 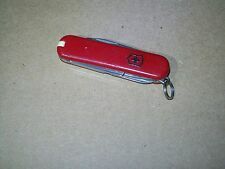 This small Swiss Army Knife features a nail file with small screwdriver tip, scissors with adjustable screw (retired), a small blade, key ring, tweezers and a toothpick. It's in very good condition with pristine blade and tools and a few scuffs on scales. Model 54753. In 1897 the Original Swiss Army Knife was created in the small village of Ibach, Switzerland. The ultimate in cool, yet still so hot. Spartan Features We also have a full line of original Victorinox Swiss Army Accessories. Model # 53186. In 1897 the Original Swiss Army Knife was created in the small village of Ibach, Switzerland. We also carry a full line of original Victorinox Swiss Army Accessories Including Cutlery Edge Guards! Closed length. Expiration Date: 9/2019 or later. Product Specifications. Trending at C $51.23eBay determines this price through a machine-learned model of the product's sale prices within the last 90 days. Item No: 53002. In 1897 the Original Swiss Army Knife was created in the small village of Ibach, Switzerland. Victorinox Original Swiss Army Knife. We also have a full line of original Victorinox Swiss Army Accessories.